Felting a knitted or crocheted item is not new, but it is making a style resurgence. It is a look that nearly, if not completely, causes your stitches to disappear. Anyone who hand knits knows that not all your stitches come out even. This process takes care of that problem in your completed project. A simple felted purse is a good place for the beginner to start. Purchase your materials. The yarn must be wool that is non-washable, preferably 100 percent wool. 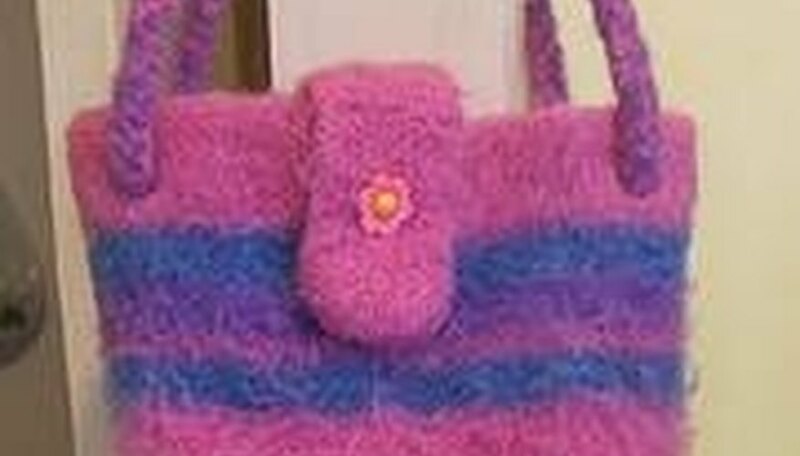 To add interest to your felted purse, work two contrasting strands of wool yarn together as you knit. The yarn packaging should tell you what size knitting needles are recommended for that particular yarn. Choose knitting needles one or two sizes larger than recommended, depending on the thickness of the yarn and how many strands are used. Choose a simple knitted purse pattern for your first try. Check out the resource section, below, for websites with free patterns. After your project is completed, place it in a pillow case, using safety pins to close the top. Wash the knitted purse in hot water in the washing machine along with 1 tablespoon of baking soda. Throw a towel in with the pillow case to help with the agitation. After one washing, check the size. If you want more shrinkage or the stitches are still too noticeable, wash it again. Place your washed felted purse on a towel to dry. Reshape with your hands by pulling on corners and edges. Turn it over often and change the towel when it becomes too wet. When your felted purse is completely dry, it's ready to use.